This is my 10 year old son Lukas. 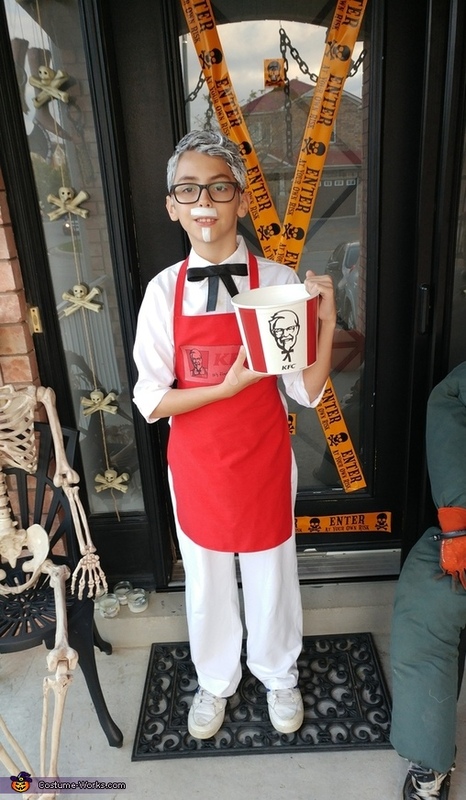 He loves KFC's popcorn chicken so much that he wanted to pay homage to the MAN. This was pretty easy to put together. Bought a pair of white pants and shirt from Value Village. Made the apron from red fabric and ironed on the KFC logo. Created the iconic tie by sweating a bow out of the handle of a reusable black bag (not reusable anymore I suppose). He received so many compliments both at school and out trick or treating. He was definitely the hit of Halloween.